Happy Labor Day! I hope most of you are enjoying a well deserved day off. I'm going to take a nice long bike ride this morning, do a little housework in the afternoon, then I'll BBQ tonight and use up the last of the summer's hamburgers and hot dogs. How about you? Yesterday I spent a leisurely couple of hours in my craft space, and one of the things I created was this card using the new Expressions Thinlits Dies. What a great sketch from Freshly Made Sketches this week! Too bad it's the last day of the challenge. I wanted to use it again! 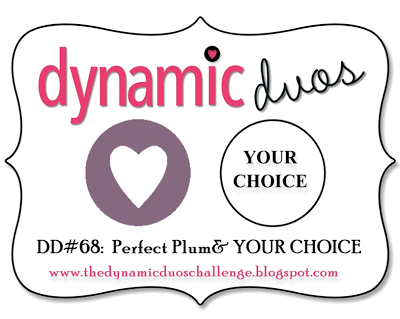 At Dynamic Duos this week we get to create our own duo using Perfect Plum. I paired it with Raspberry Ripple for a sweet color combination. I love these Thinlits! 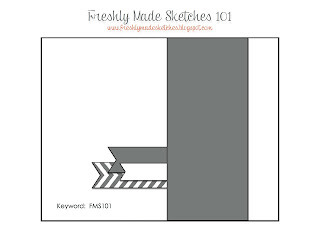 If you're using them, be sure to layer some waxed paper between the card stock and the die for easy removal. A Two-Way Glue Pen is my adhesive of choice. 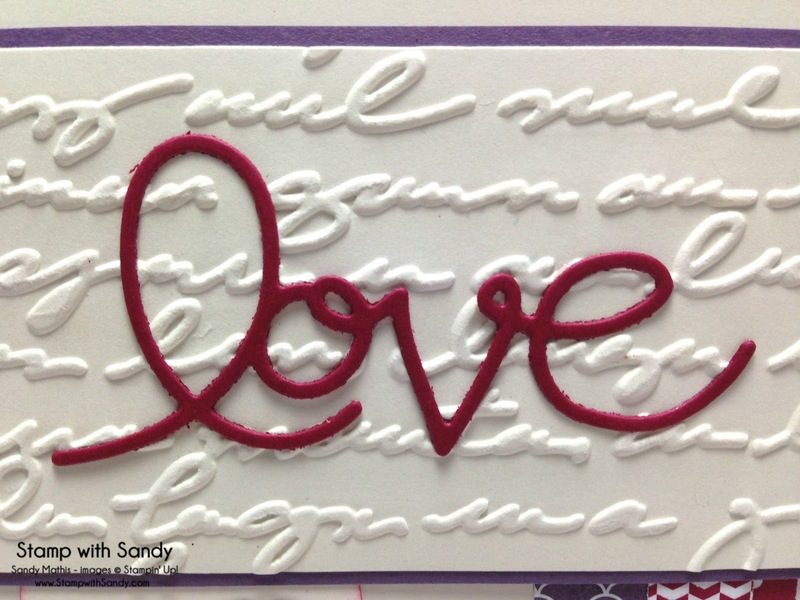 What a sweet card, Sandy! I love the way you've used the Expressions Thinlit. And I love all of the crisp, clean white space. Love you, too, Sandy! This is a keeper and a winner, perfect for all the challenges!! 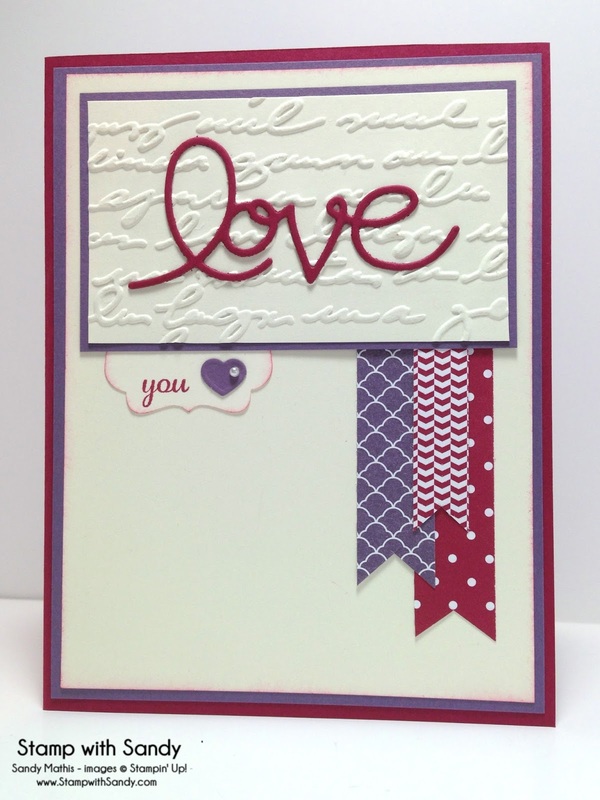 Love your card, the delicate love die cut and those fun banners. Thank you so much for sharing with us this week at Dynamic Duos! 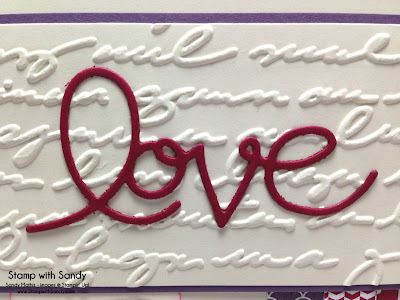 "LOVE" this card - love it to bits!